Select the color method, symbol, and size from the appropriate combo boxes. The Show in Cutaway check box allows you to show points or vertices in cutaway regions in the 3D Viewer window. When this option is disabled, points or vertices will not show in any areas that have been “hidden” in the 3D Viewer window by creating “Cutaways”. For information on creating cutaways, please see "Adjusting Viewer Settings" section. •Specified: Points are colored using the color specified in the General settings. •By Attribute: Points are colored based on a specified data object attribute as explained below. Data objects can be colored based on a specified attribute. Color rendering can be applied to any shape element that contains attributes. To color a data object by attribute, follow the steps below. •From the Color combo box, select the By Attribute option. 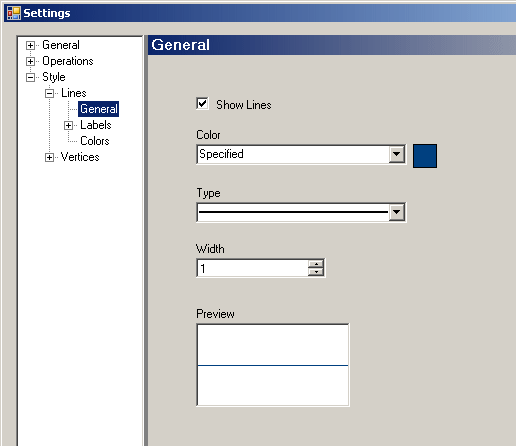 •From the Settings tree, select the Colors node and the following dialog will appear. ZoneID, Evapotranspiration Rate, Extinction Depth. 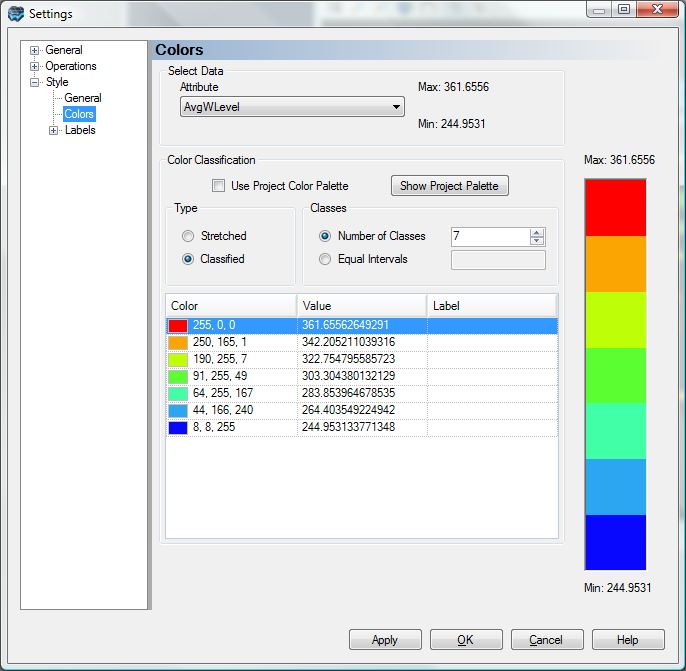 •Select the Color Classification: by default, the colors will be calculated from the min and max values for the current data object. Visual MODFLOW provides an option to use Project-wide Color Palettes. This is useful when you have multiple data objects that are rendering the same attribute (e.g. heads from different model runs, conductivity distributions), and you want to make qualitative comparisons between these. This is challenging when each data object has its own min and max values and are colored based on this. However this becomes much easier when these data objects all read from a common color palette. If this option is checked on, you can access the color palette and adjust min and max values. See Project Color Palettes for more details. •For the selected attribute, you can define various settings. These settings are described below. Type: Select between Stretched or Classified. The stretched option allows for color shading, i.e, continuous color gradient. The classified option allows for discrete intervals, i.e., zebra, in the color gradient. Classes: There are two options for defining the number of classes to be used: Number of Classes and Equal Intervals. Number of Classes: Specify the number of color classes in the text box. Equal Intervals: Specify an interval spacing, and the number of classes will be determined from the range of the attribute data. For example if your data rage is 100, and you specify a 10 interval spacing, 10 classes will be created. As the number of intervals/classes is modified, rows are automatically removed or added to the color table. For the Elevation color scheme, the maximum value will always be Red and the minimum value will always be Blue, but the gradient between will change automatically depending on the specified number of classes. •Visual MODFLOW Flex automatically calculates the intervals based on the defined specified number of classes or equal intervals. •Once the settings have been defined, click the [Apply] button to show the changes in an active 2D or 3D Viewer. Select the Show Area Fill check box to show/hide the area file. If unchecked, only the shape boundary will be visible in 2D and 3D Viewers. 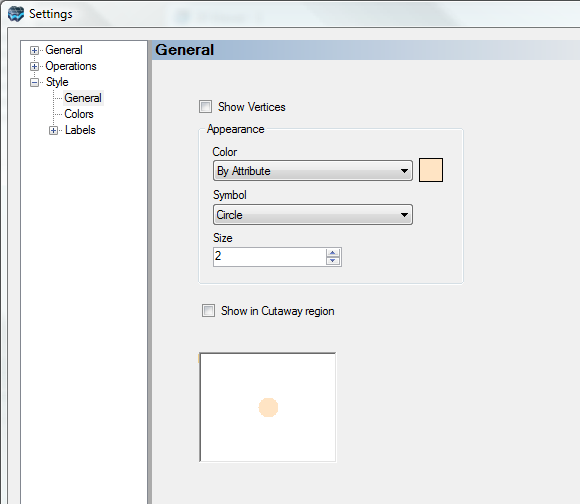 Select the color method and fill pattern symbology, from the appropriate combo boxes. •Specified: Shape is colored using the color specified in the General node. •By Attribute: Shape is colored based on an attribute. See "Color By Attribute" section for more information on color rendering. •Custom: Specify a color for the area fill. This color will overwrite the default color defined in the general settings for this particular shape element. 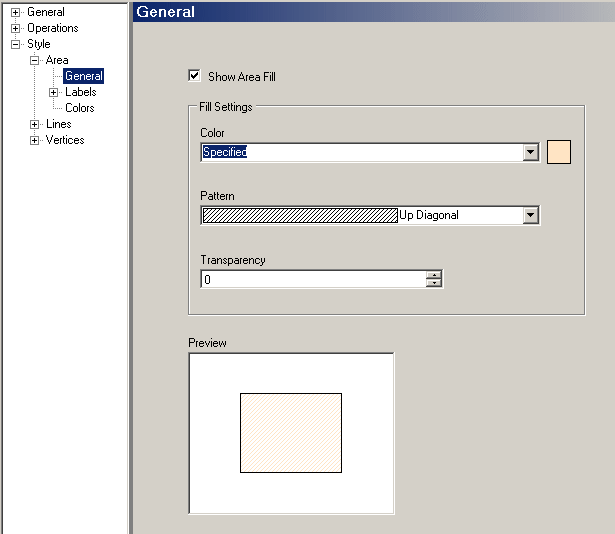 Select the Transparent checkbox to make the polygon fill pattern transparent. Use the adjacent Transparency text box to set the level of transparency, e.g., a higher value will make the fill more transparent. The Show in Cutaway check box allows you to show areas the polygon in cutaway regions in the 3D Viewer window. When this option is disabled, the polygon will not show in any areas that have been “hidden” in the 3D Viewer window by creating “Cutaways”. For information on creating cutaways, please see "Creating Cutaways". Select the Color method, line Pattern (solid or dash), line Width from the appropriate combo boxes. •Specified: Line is colored using the color specified in the General settings. •Custom: Specify a color for the line element. This color will overwrite the default color defined in the general settings for this particular shape element. The Show in Cutaway check box allows you to show areas the line in cutaway regions in the 3D Viewer window. When this option is disabled, lines will not show in any areas that have been “hidden” in the 3D Viewer window by creating “Cutaways”. For information, please see the "Creating Cutaways" section. •Show Labels: Show/Hide the labels in 2D/3D viewer. 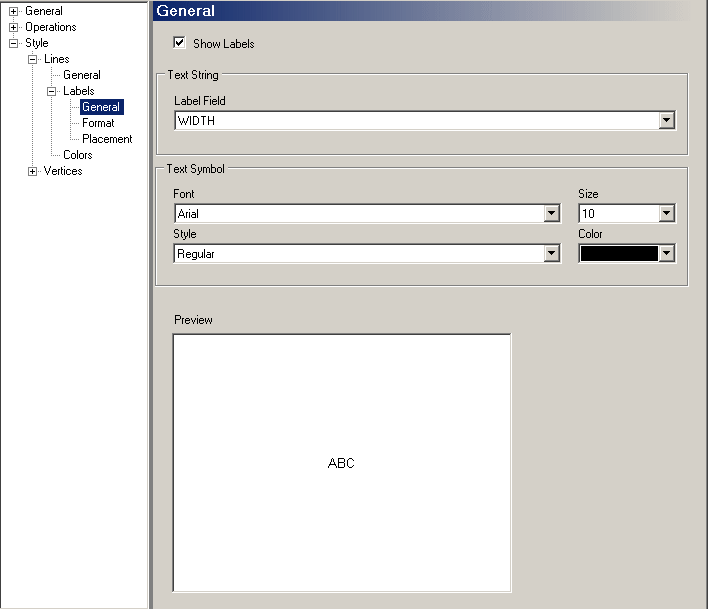 •Label Field: This combo box contains all attributes for the selected data object. Select the desired attribute field to use for the labels. •Font: Select the label font from the combo box. •Size: Set the text size of the labels. •Style: Set the font style for the labels, e.g., Regular, Bold, Font, Italicized, etc. •Color: Set the color of the label text. •Format: Choose between Numeric or Scientific notation. •Decimals: Set the number of decimals to plot for each label. •Position: Display the label above, below, or on the line. •Offset: This parameter controls how far the label will be placed from the line. •Location along the line: Display the label at the start, in the middle or at the end of the line. •Orientation to the line: Display the label parallel, perpendicular or horizontal to the line.